Black-Out Smartglass offers a complete black-out effect on demand. Black-Out Smartglass from Smartglass International is the only glass product that offers complete privacy and light control at the flick of a switch. Black-Out Smartglass offers greater than 99.4% visible light block and 100% UV protection and can be controlled using range of wall switches, remote controls, movement sensors, light sensors or timers depending on each customer’s individual needs. It is particularly beneficial in commercial and high-end residential use. Black-Out Smartglass is the perfect solution for home cinemas or meeting rooms where on-screen presentations are made. Black-Out Smartglass is also ideal in any situation where curved or overhead glass panels are used making the use of blinds impossible. 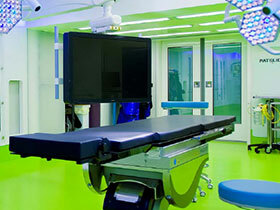 In hospital and institutional environments where patient safety and security has to be ensured, Black-Out Smartglass is the safe and hygienic solution. Black-Out Switchable Glass is only available from Smartglass International. Through extensive research and development Smartglass has achieved a real first in the evolution of switchable glass products. Learn more about our Switchable Smartglass.